Baby boomer and future Ghostbuster Ernie Hudson (nee Ernest Lee) was born December 17, 1945 in Benton Harbor, Michigan. Raised by his grandmother after his mother died when he was less than 6 months old, Hudson grew up in poverty. He joined the U.S. Marine Corps after graduating from Benton Harbor High School in 1964, and lasted 3 months before his asthma resulted in a discharge. Ernie Hudson worked odd jobs and got married in 1963 at age 18 to even younger baby boomer 16-year-old Jeannie Moore. Hudson told Kurt Anthony Krug of The Herald Palladium in a 2006 interview, that the young couple moved to Detroit, Michigan so Moore could attend college. Hudson himself applied to Wayne State University once there, but was rejected the first time due to low grades. He reapplied a year later and was accepted, eventually graduating with a BFA in 1973. While attending Wayne State University, the Hudson's had sons Ernest Jr. (b.1966), and Rahaman (b. 1969). Ernie Hudson also became a playwright at a black theatre company (Concept East) and founded the Actors' Ensemble Theatre for young black actors, writers, and directors. When Ernie Hudson graduated from Wayne State University with a BFA in 1973, he was offered and accepted a full writing & acting scholarship at Yale University in their MFA program. Hudson's pursuit of his studies at Yale and acting work often took him away from home; in 1975 he and Jeannie separated and Hudson took his sons to live with him in California. Their divorce was finalized the next year, just as his first small role in a feature film was debuting - Leadbelly (1976). Ernie Hudson acted steadily in television, in miniseries such as King (1978), movies, and roles on TV series, as well as on the big screen, spurred on by the knowledge he was a single father to two young sons. Ernie Hudson married Linda Kingsberg in 1985. He told People Magazine's Tom Gliatto and Tom Cunneff in 1992 that although they had originally met while Hudson was separated from Jeannie, fears over racial prejudice at the time (Linda is white) made him nervous about committing. He said that realtors were reluctant to show them houses and his wife Linda added "People told us not to have children, because the children would be confused." The couple disregarded the naysayers and had two sons together - Andrew (b. 1988) and Ross (b. 1990). This year in 2015 Linda & Ernie celebrate their 30th wedding anniversary. It was Ghostbusters (1984) that finally catapulted Ernie Hudson into the spotlight of a co-starring role with Bill Murray in a major movie. He reprised the role of Winston Zeddemore for the sequel, Ghostbusters II (1989). In his 50+ years, Hudson landed his first long-running role on the HBO television series Oz, as prison warden Glynn; his son Ernie Hudson Jr. played an inmate during the third season. The series lasted from 1997-2003. Ernie Hudson also appeared as Sandra Bullock's FBI boss in Miss Congeniality (2000) and the sequel Miss Congeniality 2: Armed & Fabulous (2005). 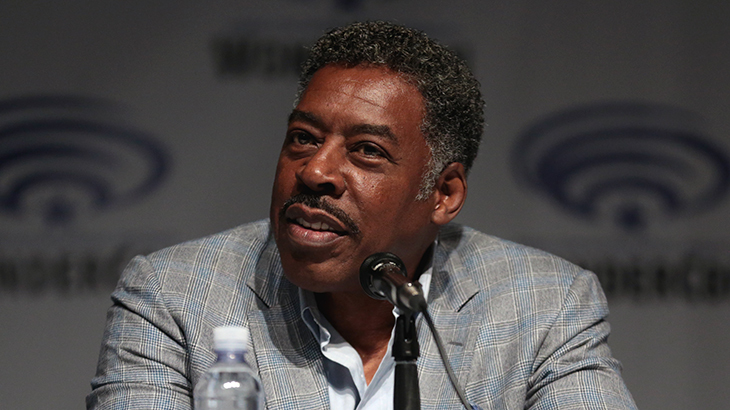 As a senior citizen, Ernie Hudson has continued to act steadily in the movies and on television. He had a recurring role in The Secret Life of the American Teenager (2008-2018) as Dr. Ken Fields, and did voice-acting on Transformers: Prime (2010-2013). His episodic work on television series has averaged 2-3 television show a year. This is almost matched by his work in movies, at the rate of 1-3 year as a senior citizen...and he shows no signs of retiring or slowing down. Below, Hudson was interviewed on New York Live and talked about his career. "To me acting is a journey filled with incredible discoveries. Getting old will never be an issue for me as long as I can explore the parts I want to play." Happy 70th Birthday, Ernie Hudson!